​ Scientists predict that our home, planet Earth, probably formed about 4.6 billion years ago. Around 4.3 billion years ago, the Earth began to cool, allowing land, water and the atmosphere to develop. Early Earth was wrought with active volcanoes and asteroid strikes. 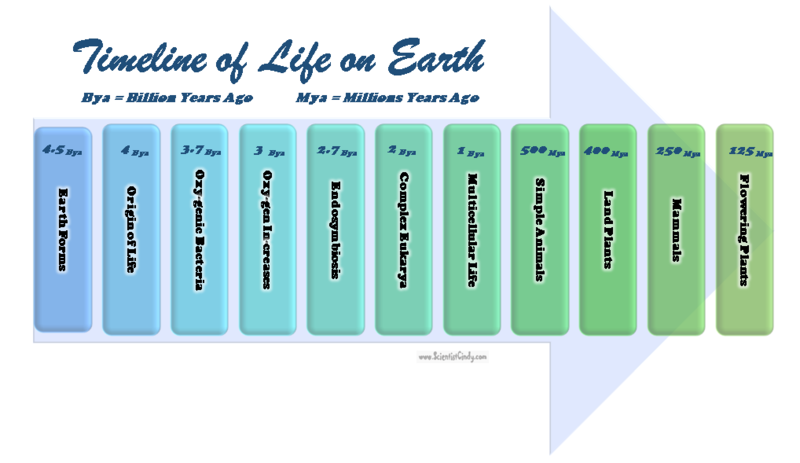 The oldest traces of what might be considered "life" are 3.8 billion years old. However, these entities (chemofossils) are so foreign to what we consider to be "living" today, scientists are still debating on if these chemofossils can be considered a true life-form. This chemofossil was found nestled inside 3.8 billion year old rock found in Greenland. The fossil contained phosphatic minerals and carbon. Living organisms have a characteristic ratio of carbon-12 to carbon-13 (this is what allows for dead organic matter to be carbon-dated). This chemofossil exhibited the characteristic carbon-12 to carbon-13 ratio characteristic of once living organisms! Scientists have discovered fossils of prokaryotic organisms that lived as far back as 3..5 billion years ago. Prokaryotic organisms are organisms that are made up (almost exclusively) of a single prokaryotic cell. The vast majority of prokaryotic organisms are microscopic, meaning that they are only visible with the aid of a microscope. 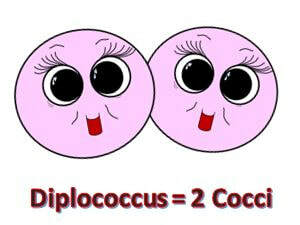 For this reason, prokaryotic organisms are called "microbes". The oldest fossils we currently have on record are of cyanobacteria, formerly called "blue-green algae". Before more was known about these organisms, they were called blue-green algae, because of their resemblance to true algae. However, cyanobacteria are not algae at all, but far from it! Algae are considered eukaryotic and are made up cells that are very different from the cyanobacteria. Cyanobacteria are prokaryotic organisms that are made up of prokaryotic cells. Prokaryotic cells lack a nucleus and lack membrane-bound organelles. In contrast, algae are eukaryotes that are made up of eukaryotic cells. Eukaryotic cells contain a nucleus and membrane-bound organelles. Most prokaryotic organisms are bacteria. 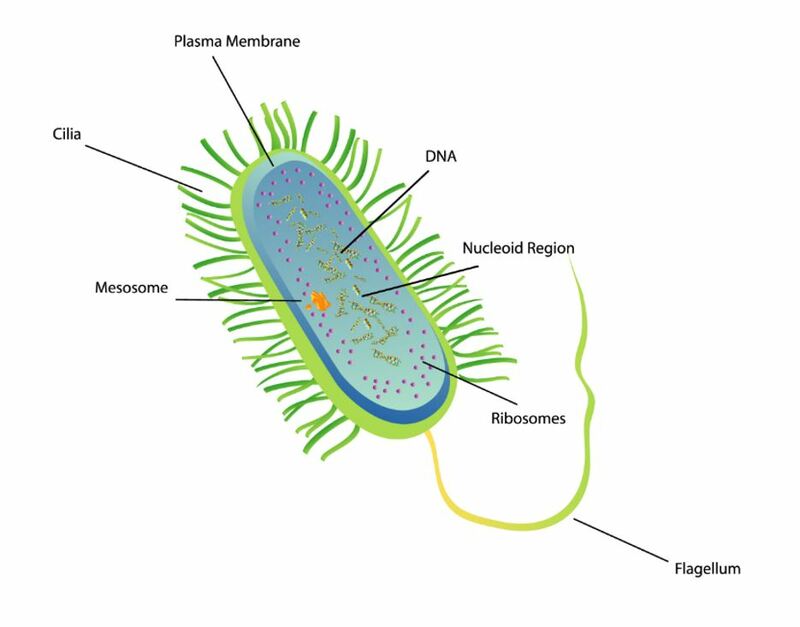 All bacteria cells contain cytoplasm, a cell membrane (also called the plasma membrane) and genetic material. and a nucleoid in which the genetic material resides. Bacteria usually take on only a few different shapes (morphologies) and arrangements. 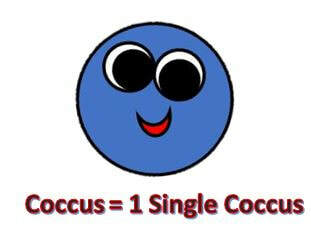 The round bacteria cells are called Cocci (plural) or Coccus (singular). 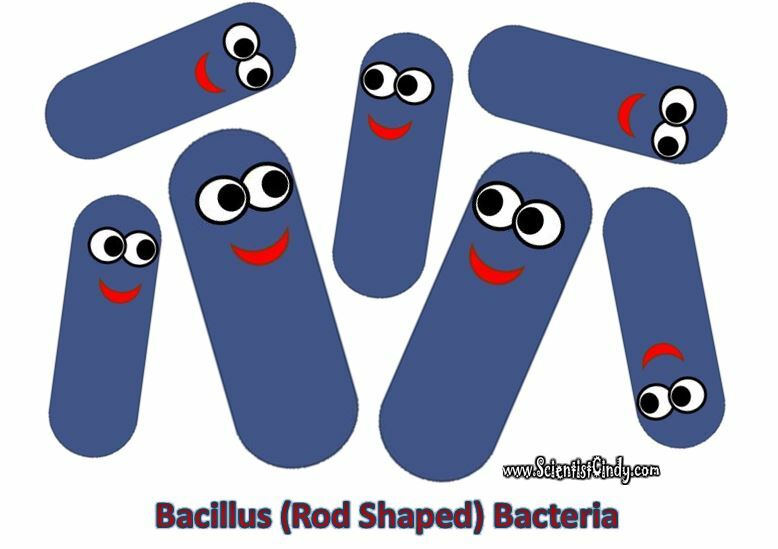 Rod-shaped bacteria cells are called Bacilli (plural) or Bacillus (singular). 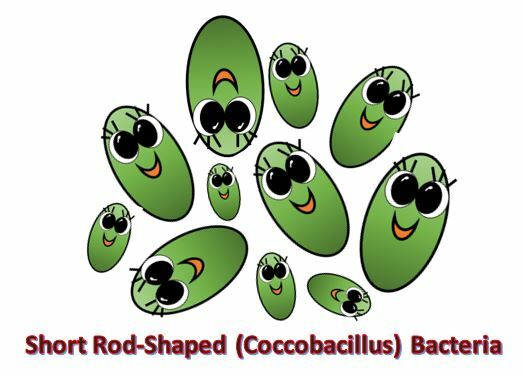 The short rod-shaped bacteria cells are called Coccobacillum (plural) or Coccobacillus (singular). 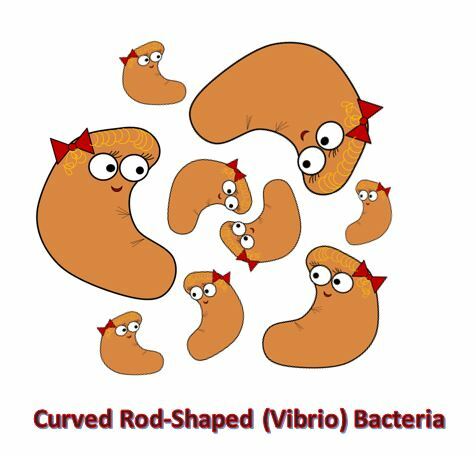 The curved rod-shaped bacteria cells are called Vibrios (plural) or Vibrio (singular). 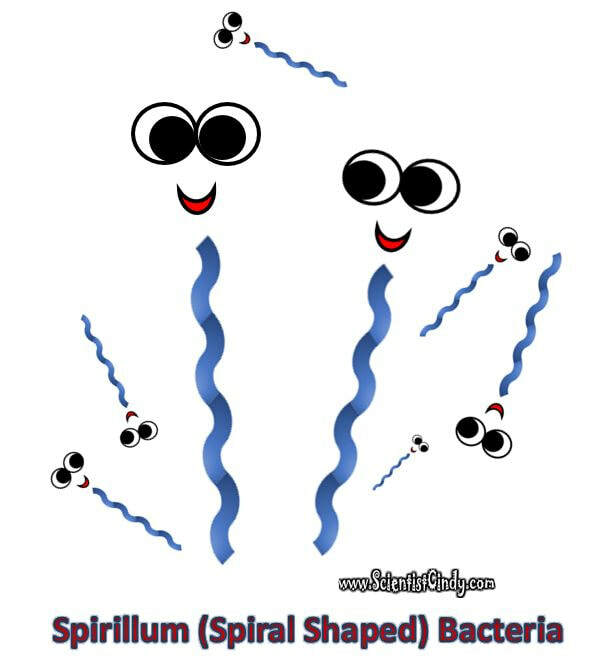 The loose helical spiral-shaped bacteria cells are called Spirochettes (plural) or Spirochette (singular). Bacteria cells typically arrange themselves with other bacteria cells to form certain arrangements. Some of the more common arrangements bacteria form will be briefly described here. 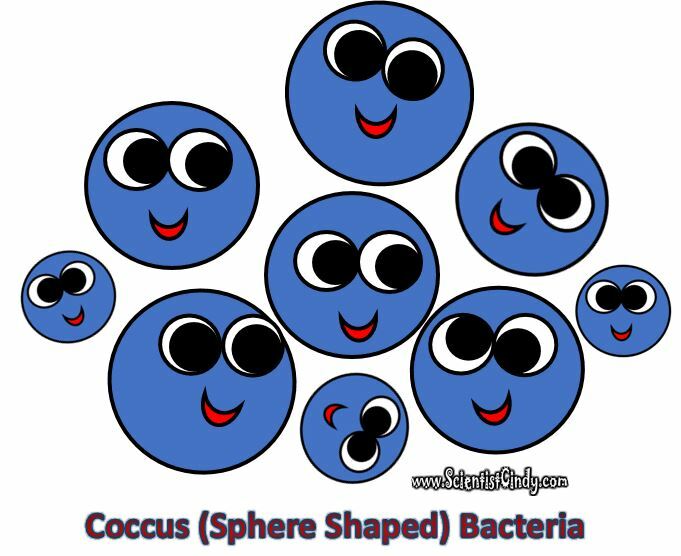 The arrangements for the round bacteria (cocci) include the coccus the diplococcus, the tetrad, the streptococcus and the staphylococcus. 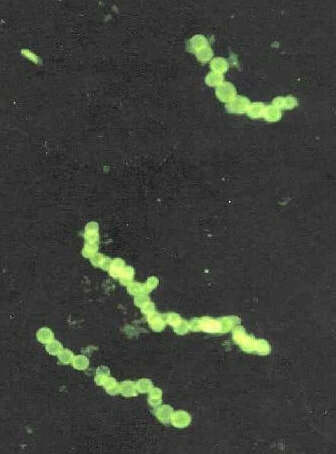 The rod-shaped bacteria also form chains. 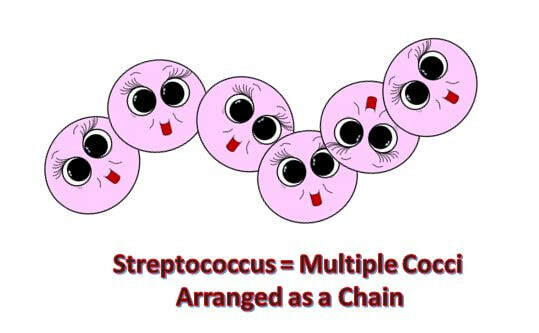 A chain of bacilli is called streptobacillus. A single rod-shaped bacteria is called a bacillus. Prokaryotic cells do not have a true nucleus, but they do have genetic material. The genetic material of prokaryotic cells exists in a region called the NUCLEOID. The nucleoid IS NOT surrounded by a membrane, while the nucleus of eukaryotic cells IS surrounded by a membrane. The genetic material of the nucleoid is very different from the genetic material found in eukaryotic cells. The DNA of prokaryotic cells usually consists of a single circular chromosome. 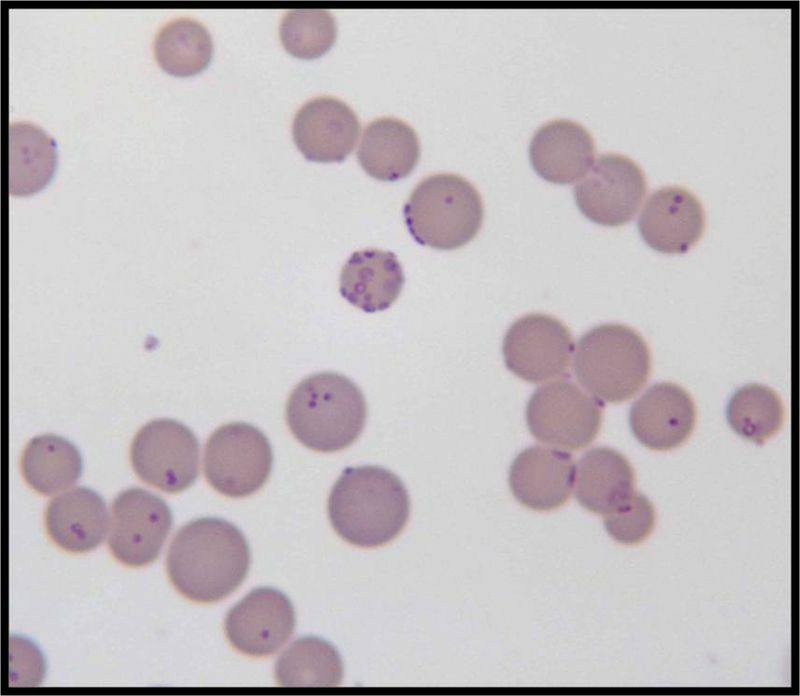 In addition to this single chromosome, many prokaryotic cells also carry a small, circular, segment of double-stranded DNA that is considered extrachromosomal. 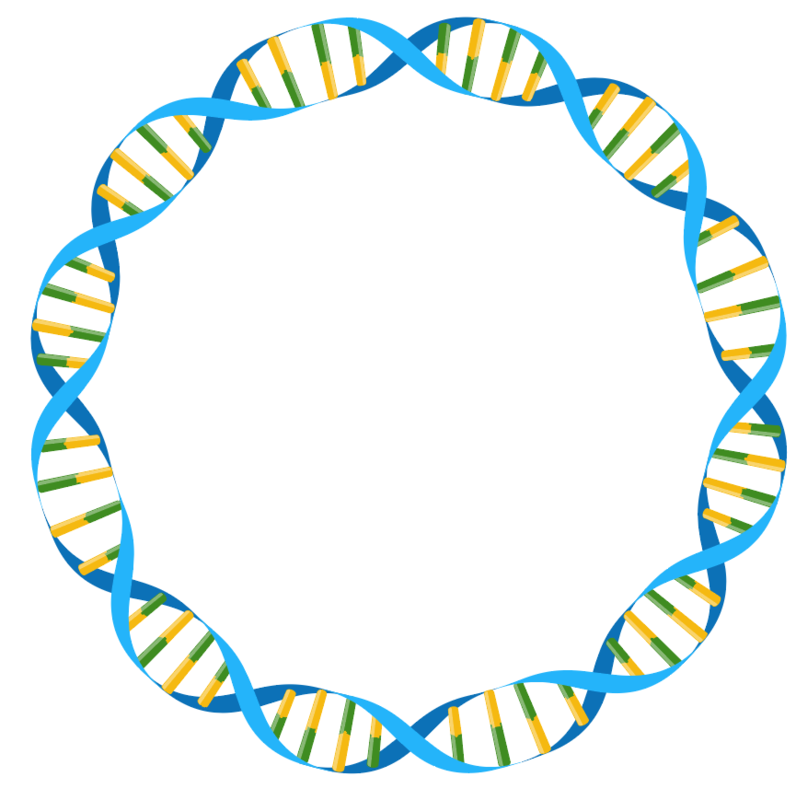 This piece of extrachromosomal DNA is called a plasmid. The DNA of archaea has histones (as do eukaryotes), whereas the DNA of bacteria lack hostones. 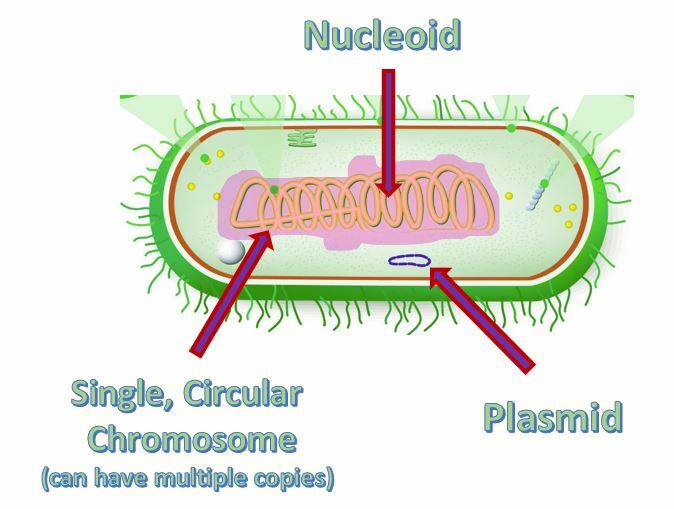 Illustration of the Nucleoid and the Genetic Material of a Typical Prokaryotic Cell. Prokaryotic cells can be either archaeal cells or bacteria cells. The cell membranes are fundamentally different among the cell belonging to the three domains of life (archaea. bacteria and eukarya). Unbranched (straight) lipid chains (fatty acids). The cell membrane holds proteins that carry out a variety of functions. Almose all bacteria cell have a cell wall. The cell wall of bacteria has a unique biochemical makeup. Only bacterial cell walls contain peptidoglycan (or murein). The layers of the bacterial cell wall is composed N-acetylglucosamine (NAG) and N-acetylmuramic acid (NAM) that are woven like a fabric into a protective, strong barrier for the cell. 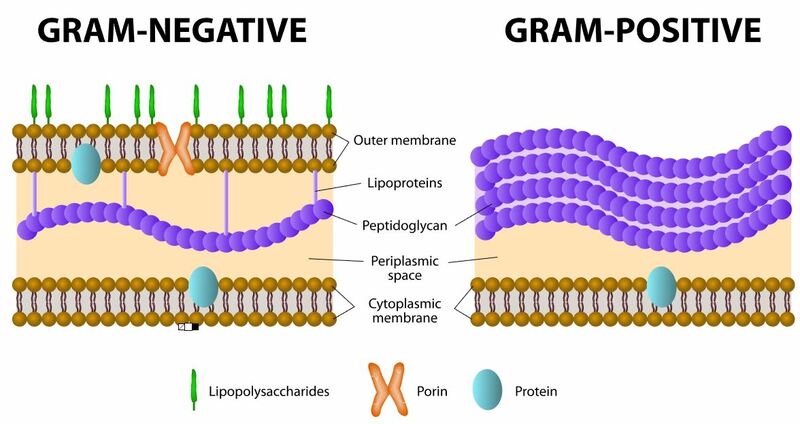 Gram-Negative Bacteria - In gram-negative bacteria, tetrapeptide chains extending from each NAM unit are directly cross-linked. Gram-Positive Bacteria -, In gram-positive bacteria, tetrapeptide chains are linked by pentaglycine cross-bridges. Gram-Negative Bacteria - In gram-negative bacteria, tetrapeptide chains extending from each NAM unit are directly cross-linked. Gram-Positive Bacteria -, In gram-positive bacteria, tetrapeptide chains are linked by pentaglycine cross-bridges. A Gram stain of mixed Staphylococcus aureus (S. aureus ATCC 25923, gram-positive cocci, in purple) and Escherichia coli (E. coli ATCC 11775, gram-negative bacilli, in red), the most common Gram stain reference bacteria. 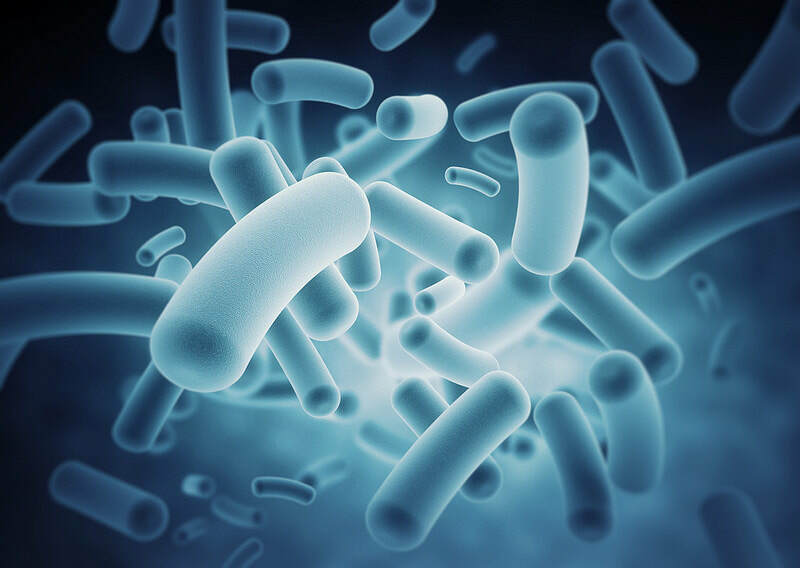 Bacteria are categorized as either gram-positive or gram-negative, depending on the composition of their cell wall. A sample of bacteria can be easily identified as either being gram-positive or gram-negative by using a Gram stain. Many antibiotics target peptidoglycan, because it is unique to bacteria. The antibiotic disrupts the cell membrane which leave the bacteria cell vulnerable to osmotic pressure. Crenation or lysis will then occur, killing the bacteria cell. Both prokaryotic cells and eukaryotic cell contain ribosomes. The function of ribosomes is to provide the location for protein synthesis to take place. However, the ribosomes or prokaryotic cells are located in the cytoplasm and are a different size (70S) than those found in the eukaryotes (80S). 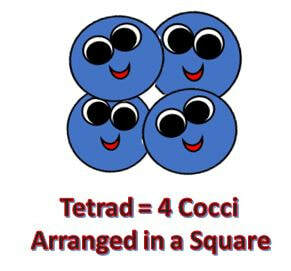 S is a unit of measure of size (the Svedberg unit) based on how quickly it forms a precipitate upon centrifugation. A single Svedberg unit is equal to 100 femtoseconds, or 10^13 seconds. Prokaryotic cells contain additional structures called inclusions, that do not exist in eukaryotic cells. These inclusions function to store nutrients within the cell. Some prokaryotic cells have the ability to undergo a type of dormant state called sporulation. When conditions are unfavorable, the genetic material forms a protective membrane, called an endospore, that surrounds and protects the genome. The DNA lies protected in this dormant state indefinitely, until conditions improve. 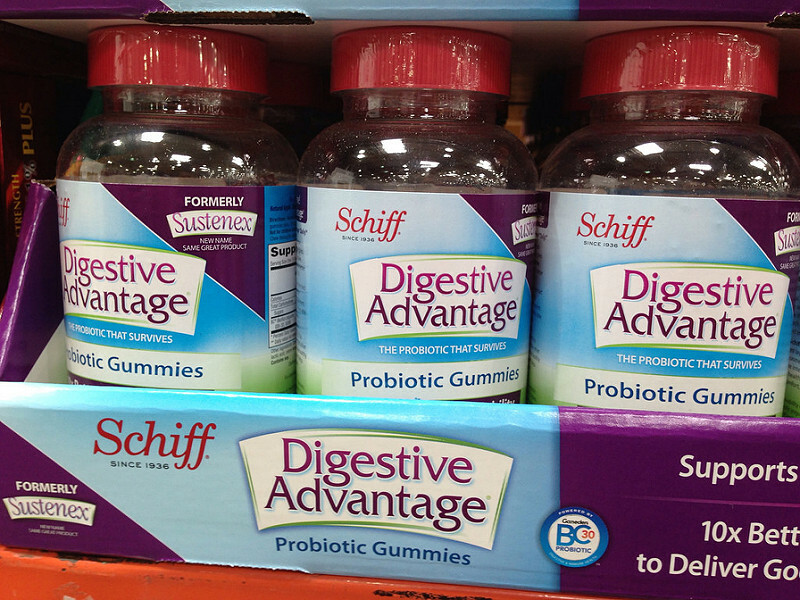 In fact, co-existing with certain bacteria is SO necessary for good heath, that a billion-dollar industry has formed providing these bacteria to consumers in the form of pills labelled "probiotics"! General classes of multicellular bacteria. ​The smallest bacteria discovered to date, is the Mycoplsma which measure around 0.2 μm. 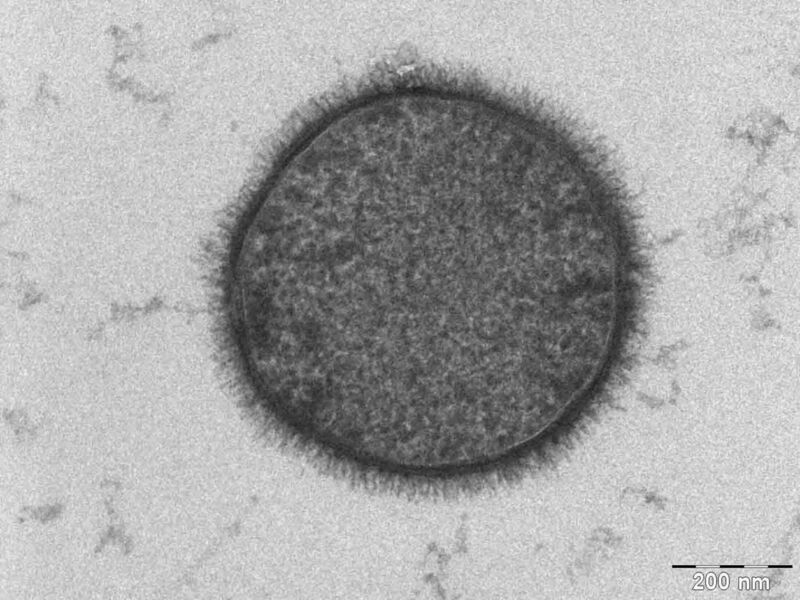 ​The largest bacteria discovered to date, is the Thiomargarita namibiensis which measure around 700 μm.